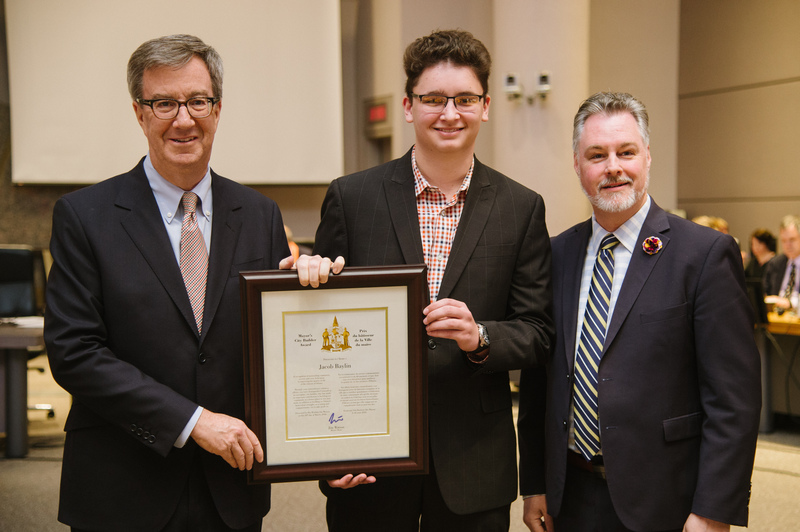 Jacob Baylin was presented with the Mayor’s City Builder Award at today’s City Council meeting by Mayor Jim Watson and Bay Ward Councillor, Mark Taylor. Not many 16 year olds would think of donating their own money to a sports club. However, Jacob Baylin saw the financial challenges facing many families at the Bell Warriors Football Club and he chose to step up. Jacob was an award winning player at the Club and has continued to donate even after his playing days. He recently became the youngest person in the club’s 62-year history to be named a Friend of the Warriors sponsor. A key mandate of the Bell Warriors Football Club is to keep the sport “Affordable for All”. The club also aims to instill the value of setting an example through one’s actions. This idea has become a focal point in the Club’s communication efforts and has ultimately led to more than a half dozen sponsors for the non-profit youth sports club. True leaders strive to be part of the solution and that’s what Jacob is all about. His selfless contribution has set an example of leadership and thoughtfulness. As one of the team’s most recent alumni, he has learned by example and become a catalyst for change.